Expecting? Thinking about getting pregnant? Then it’s a very good idea to take a daily prenatal vitamin. Prenatal vitamins are important not only for your health, but for your baby’s as well. But while taking the vitamin is a no-brainer, choosing which one to buy can seem like rocket science. To help you out, we’ve done some research for you. Below you will find a review of what ingredients to look for (and why), answers to common questions about prenatal vitamins, plus a bit about some of the best-selling brands. 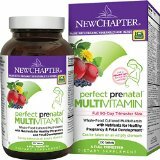 Prenatal vitamins should be taken daily during pregnancy. Because you may not know you are pregnant until several weeks into your pregnancy, start with a daily prenatal vitamin as soon as you start trying to conceive. Look for a prenatal vitamin with folic acid or folate, iron and calcium. Whether through a vitamin or your diet, pregnant women also need to make sure to get enough DHA, vitamin D and iodine. Check with your OB/GYN to see if he or she recommends a specific vitamin or supplement for you. Folate or folic acid are incredible for the development of your baby’s brain. This vitamin helps prevent neural tube defects (like spinal bifida) and other serious abnormalities of the brain and spinal cord such. Because much of the baby’s brain develops during the first trimester (before most people know they are pregnant), it’s important to get enough folate/folic acid from the time you start trying to conceive. Most prenatal vitamins have folic acid rather than folate, but you may want to try and find one with folate. What’s the difference between folate and folic acid? Folate occurs naturally in foods like liver, beans and spinach. Folic acid is the man made, synthetic form of the vitamin that you will find in most supplements. Some new research suggests that too much folic acid can increase the risk of certain cancers. Iron is important both for mamma and baby. In addition to aiding in your baby’s development, iron helps prevent anemia. (Common to pregnant women, anemia is when you do not have enough red blood cells.) To improve your body’s absorption of iron, take it together with vitamin C and don’t consume dairy products or caffeine two hours before or afterwards. Iron is found in many prenatal multivitamins. You can also take it as a pill or a liquid supplement. Calcium is important for your bones - and your baby’s! It’s especially important to get enough calcium during the third trimester, when the fetus’s bones are growing most rapidly and preparing for the big debut. In addition to your calcium supplement, try drinking lots of low fat milk and eating yogurt, leafy greens, broccoli and sardines. While too much vitamin A is toxic, you do want to be sure to get enough. Vitamin A deficiency can cause fetal and infant growth retardation. It has also been linked to blindness in studies conducted in the developing world. Look for a prenatal vitamin with beta-carotene, the safest source of vitamin A.
Vitamin C helps your body absorb iron and gives your immune system a boost. Do keep in mind, however, that more than 2,000 mg can be dangerous for your baby. Vitamin C is easy to get in from your diet and can be found in citrus fruits, red peppers, papaya, strawberries, pineapple, kiwi, cantaloupe, and raspberries. Vitamin D helps in the development of your baby’s bones and is thus particularly important during the third trimester. New studies show that taking a very high dose of vitamin D can greatly reduce complications including preterm labor, preclampsia and gestational diabetes. These studies refer to taking as much as 10 times the recommended amount of vitamin D, however, which other studies argue can be dangerous. Consult with your doctor before taking large doses of Vitamin D.
Iodine is important for your baby’s developing thyroid and brain. Most supplements don’t carry it but you can take it separately or look for one that does. It’s relatively easy to meet the daily recommendation of iodine without taking a supplement. Half ot the table salt sold in the U.S. is enriched with iodine to prevent iodine deficiencies. Other natural sources of iodine include dairy products, eggs, seafood, yeast and vegetables. Depending on where you live, the water you drink may also be a good source of iodine. Omega-3 fatty acids (including EPA or eicosapentaenoic acid and DHA or docosahexaenoic acid) help promote the development of your baby's brain and eyes. It’s also beneficial to the heart and immune system. Omega-3 has also been used to help men and women with mood disorders and research shows that it can help prevent certain cancers, inflammatory bowel disease and other autoimmune diseases. Do they make you nauseous? 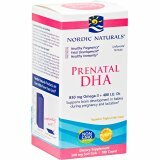 As if the nausea of the first trimester isn’t enough, some prenatal vitamins can make you feel queasy, particularly if they have DHA or Omega-3. Omega-3 often has a “fishy” aftertaste that can stick with you for awhile. If your prenatal vitamin is making you nauseous, try taking it with food or just before hitting the sack at the end of the day. Rumor has it that vitamin B6 helps combat nausea. Try taking it to reduce your morning sickness and make that first trimester a whole lot easier! Do they make you constipated? While iron is essential to your health and helps prevent anemia in pregnancy, this important substance can often cause a bit of constipation. To keep things moving along, drink tons of water (more than 8 glasses a day! ), get lots of fiber and stay active. If things are really clogged up, you may want to try a stool softener like Metamucil. Just be sure to check with your doctor first. When should you take prenatal vitamins? You can take prenatal vitamins any time of day. If you experience nausea as a side effect from your vitamin, try taking it with food, plenty of water and at night, just before you go to bed. If you are taking an iron supplement, wash it down together with a glass of orange juice or another good source of vitamin C. The vitamin C will help your body absorb the iron. It’s also recommended that you avoid dairy products and caffeine two hours before and after taking iron to aid in absorption. Are the ingredients all natural? Organic? Non-GMO? 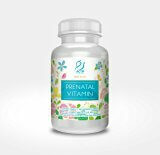 Some manufacturers of prenatal vitamin offer vegan-friendly and organic supplements. You can look for vitamins that are organic, plant-based or non-GMO. How do I know if the brand is a good one? Nature Made is owned by Pharmavite, LLC, California-based company that was founded in 1971. Their prenatal vitamins are USP Verified. This company is famous for their popular, sweet-tasting gummy vitamins. They were dounded in 1998 with the mission: “We Make Nutrition Taste Good. Owned by Bayer, One-A-Day has been around since 1940. Their women's multivitamin was reviewed and approved of by Consumer Lab during a review of 28 top-selling vitamin products.